New Hope-Solebury High School senior Tyler Roach has the future of technology in his hands – and in his eyes. Roach, who can trace his fascination with technology to the age of six, is the owner of an innovator edition of the Samsung Gear VR, powered by Oculus. Essentially a headset used for digital exploration, Facebook CEO Mark Zuckerberg believes in it so strongly that he spent $2 billion to call it his: Oculus VR, the leading company in virtual-reality technology. “It is a computer-simulated environment created by hardware devices,” says Roach, simply. The difference between VR and ordinary video games becomes obvious the moment one puts on the goggles. Hannah Loesch tested out an ocean scene and experienced life in a simulated environment: when she turned her real-life body to the left, she saw a shark. When she turned her head to look behind her, she saw a school of fish. When she leaned forward in her chair and looked down, she saw hundreds of feet of water. At the very bottom, she saw a sunken ship. Sitting up and leaning back in her chair to look up, she saw the surface of the water illuminated by the sun. “It’s so mind-blowing that you don’t even mind the dizziness,” Hannah said. But Roach doesn’t just play with virtual reality – he creates it. Using a game engine called Unity and a visual coding plugin called Playmaker, Roach has created his own applications for use on the Oculus Rift. 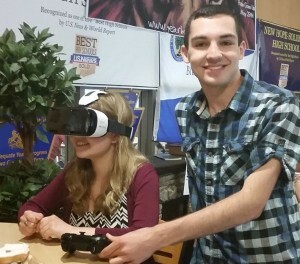 Since the beginning of the school year, Roach has been working as a paid intern at Brick Simple LLC in Doylestown, where he introduced virtual reality to the company. But virtual reality technology isn’t just for gaming. Roach is so passionate about virtual reality, he made it his goal to help bring it to the masses: especially amongst teenagers like himself, who carry the future of VR technology. In April of this year, Roach gave an inspirational presentation to about 35 gifted Indian Valley Middle School students about virtual reality technology and how to find and follow their passions. After the presentation, Roach gave each student a chance to try out his latest virtual reality creations. Most recently, Roach gave the same presentation to the Teen Reading Lounge at the Free Library of New Hope and Solebury, where he received an enthusiastic response from the students. Roach continues to be a pioneer in the world of virtual reality, and plans to make it his career. He is attending Monmouth University in the fall, where he will major in software engineering and minor in business administration. He says it is just the next step in his plan to make an impact on the world’s technology revolution. “I want to change the way people live their lives by developing innovative software that will have a huge impact on their hearts and minds,” Roach said.